حجم هذه المعاينة: 800 × 505 بكسل. الأبعاد الأخرى: 320 × 202 بكسل | 640 × 404 بكسل | 1٬024 × 646 بكسل | 1٬280 × 808 بكسل | 2٬734 × 1٬726 بكسل. 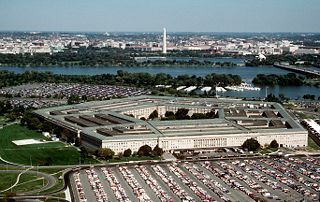 English: The Pentagon, looking northeast with the Potomac River and Washington Monument in the distance. The Tidal Basin is seen just below the Washington Monument. The marina which is visible is in Pentagon Lagoon, which is part of the Boundary Channel of the Potomac River. Trees border the Boundary Channel and exist both on the Virginia shoreline and on Columbia Island (an island in the Potomac River). Русский: Пентагон, вид с северо-восточной стороны. На заднем плане река Потомак и ru:Монумент Вашингтона. 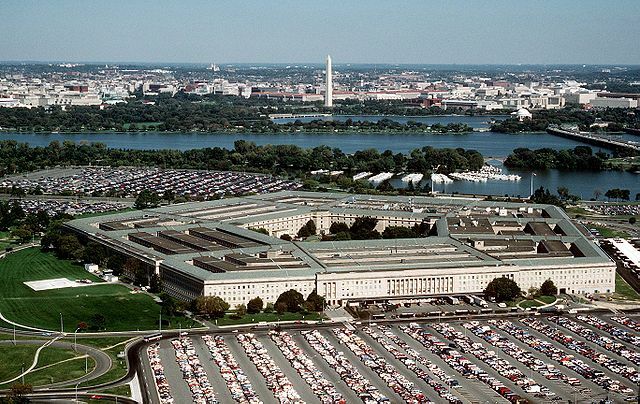 Actual date taken unknown (ArlingtonVA.US states "April 1998", cites defenselink.mil ref). المؤلف "DoD photo by Master Sgt. Ken Hammond, U.S. Air Force." The photo appears to date back to the late 1980s or early 1990s. The "portal" office buildings at the DC end of the 14th Street Bridge have not yet been built. The extra spacing for handicapped parking have not been added yet to the South Parking lot. However, the bus bays for the metro station are there, so it is after 1976.